AN extraordinary start to the new season has seen Triple Crown snare an amazing five winners with Team Snowden thanks to a winning double yesterday with Island Missile and Deladies Boy at Kembla Grange. Three-year-old gelding Island Missile (pictured), kick-started proceedings in the $30,000 Marco Polo Aged Care Services Class 1 Handicap (1400m) with a canny ride by Koby Jennings who made good use of the inside barrier and tucked the pair away on the fence. When the gap appeared in the home straight Jennings hit the go button and the son of Smart Missile simply charged to the lead and made it back-to-back victories, ahead of Dashley Dubh and Triple Crown’s other runner Bukzel which flew home for third. 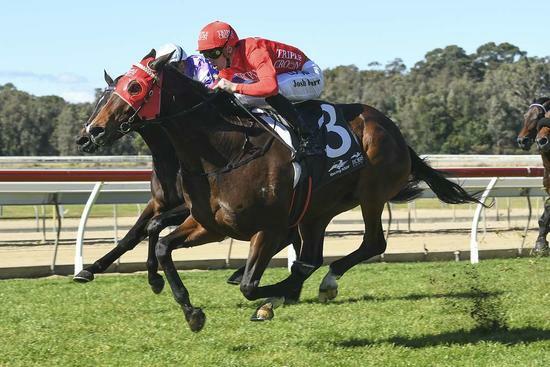 Island Missile has now registered two wins and a second from three starts for $50,000 in prizemoney. Deladies Boy, another improving three-year-old, scored decisively with a 1.8 length victory over Eight Over in the $30,000 Maiden Handicap (1600m). Despite missing the kick early, jockey Adrian Layt settled the son of Delago Deluxe on the fence and patiently bid his time under a strong tempo. Like Island Missile, the split appeared in the concluding stages and the race favourite was simply too good for his rivals.